Taiwan’s largest-ever missile ship went into service yesterday after a ceremony presided over by President Ma Ying-jeou as the island strives to modernise its military in response to a perceived threat from China. 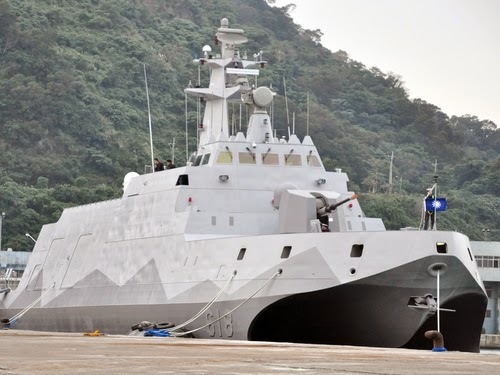 Ma praised the corvette’s “stealth and speed” at the ceremony involving hundreds of naval officers and said it “reflects the determination by the military to defend national security”. Armed with 16 missiles, the ship will strengthen Taiwan’s defence capabilities. China still considers the island part of its territory waiting to be reunited – by force if necessary. The 500-tonne corvette, named “Tuo Chiang” (“Tuo River”), will be deployed following the ceremony at the southern Tsoying naval base. It is the prototype for up to 11 others to be built for the navy. The sleek twin-hulled ship uses stealth technology to reduce the reflection of radar waves, making it harder to detect. Taiwan in December announced a new project to produce advanced homegrown surface-to-air missiles from 2015 as part of efforts to build an air defence shield. It has also announced a move to build its own submarines, which Ma said yesterday were “crucial” to its defence. The Taiwanese navy currently operates a fleet of four submarines, but only two of them can be deployed in the event of war. The other two were built by the United States in the 1940s and are too old for combat. Relations between Taiwan and China have improved since 2008 when Ma, of the China-friendly Kuomintang party, came to power. However the perceived threat remains – according to Taiwan’s defence ministry China has more than 1,500 ballistic and cruise missiles trained on the island.